The iHome iB18 are well and attractively packaged and are available in turquoise, magenta, gray, lime green and violet. They stop background noises before they reach your auricles and feature an in-line microphone (which is compatible with most mobile phones) to answer and end telephone calls. This background noise stop feature is a huge and critical facet of this product as it is often noise which can make or break your audio product. 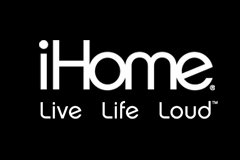 It's a difficult problem to remedy, yet, iHome has done it. That alone, sets the iB18 apart from all other earbuds, particularly in this price range. The earbuds are beautiful and have detachable ear cushions, which are available in a nice variety of sizes, for a more personalized comfort and fit. The flat cable is tangle-free and come with a travel pouch for protected travel. Also, they have a lifetime warranty. The iB18 retail for a modest $24.99 and are available here.